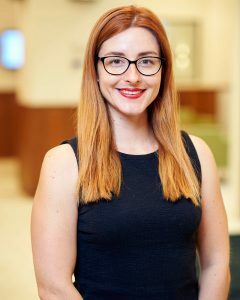 Sinziana M Popescu has a diverse engineering background (MEng in Control Engineering 2010, MSc in Microsystems Engineering 2011) with project management and Six Sigma applied knowledge in the automotive industry and research. Her cross disciplinary PhD project (2014-2017) was focused on low-cost biosensor development and rapid prototyping using novel carbon nanomaterials for prostate cancer detection (PSA) at Newcastle University, UK. Her academic expertise covers graphene-based materials, electrochemical and bioimpedance characterisation, microfabrication and coatings. During her time in the automotive industry, Sinziana acquired transferable engineering skills such as concept design, problem-solving, failure mode and effect analysis (FMEA), root cause analysis and robust design for manufacturing. She has previous experience in rapid prototyping, cleanroom environment and design of experiments (DoE) for product validation. At MD-TEC, Sinziana provides support for medical products development, human factors and usability engineering, being focused on medical product validation and commercialisation. Sinziana is also part of the European Institute of Innovation & Technology (EIT) health network and she recently obtained her PRINCE2 practitioner qualification.